The Global Volcanism Program has no activity reports for Iyang-Argapura. The Global Volcanism Program has no Weekly Reports available for Iyang-Argapura. The Global Volcanism Program has no Bulletin Reports available for Iyang-Argapura. The massive Iyang-Argapura volcanic complex dominates the landscape between Raung and Lamongan volcanoes in eastern Java. 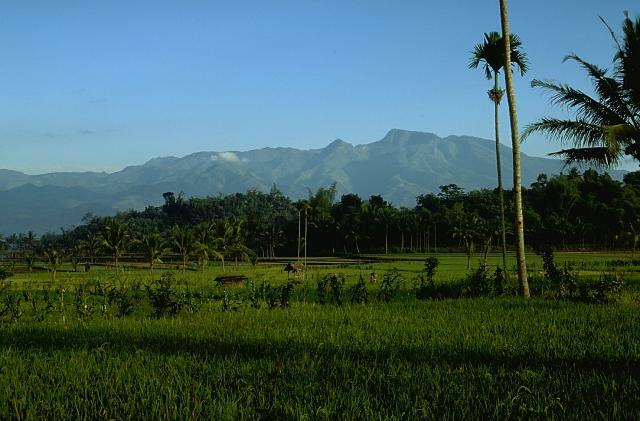 Valleys up to 1000 m deep dissect the strongly eroded basal Iyang volcano. Several Holocene volcanic cones have been constructed at the center of a N-S-trending central rift. No major eruptions have occurred within at least the last 500 years, although there was an unverified report of an eruption in 1597 CE. Fumaroles occur in some of the many explosion pits found in the summit crater complex. There is no Deformation History data available for Iyang-Argapura. There is no Emissions History data available for Iyang-Argapura. The massive Iyang-Argapura volcanic complex rises east of the lowlands across from Raung volcano. Valleys up to 1000 m deep dissect the strongly eroded basal Iyang volcano. Several Holocene volcanic cones have been constructed at the center of a N-S-trending central rift that is capped by many crescentic craters. No major eruptions have occurred within at least the last 500 years. Fumaroles occur in some of the many explosion pits found in the summit crater complex. 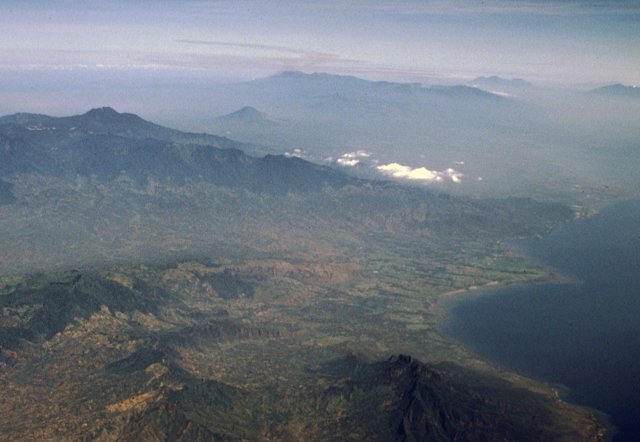 The broad volcanic complex covering much of the center of this aerial view from the NE is the Iyang-Argapura massif, which lies west of Raung volcano (out of view to the left). The small conical volcano beyond and to the right of the summit of Iyang-Argapura is Lamongan volcano, and the elongated Tengger-Semeru range lies on the right horizon. The Pleistocene Ringgit volcano lies along the coast at the lower right. 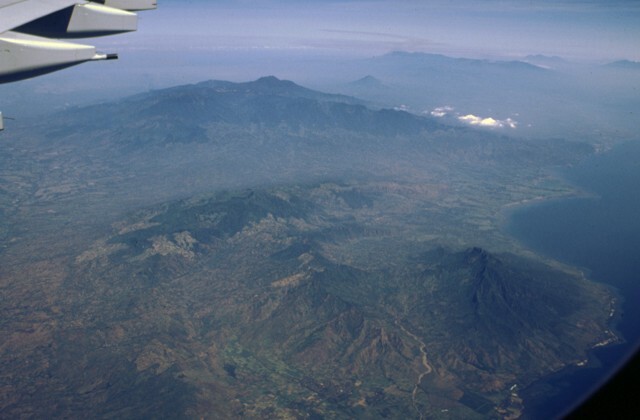 The small Lurus volcanic complex (middle right) lies along the north coast of eastern Java, below and to the right of the small cloud patches at the right-center. Lurus lies north of the Iyang-Argapura massif, the broad volcanic complex covering much of the left center of this aerial view from the NE and produced leucitic, andesitic, and trachytic rocks. The small conical volcano beyond Iyang-Argapura is Lamongan volcano, and the Tengger-Semeru massif lies along the center horizon. The triple-peaked volcano on the right horizon is Kawi-Butak. There are no samples for Iyang-Argapura in the Smithsonian's NMNH Department of Mineral Sciences Rock and Ore collection. IRIS seismic stations/networks Incorporated Research Institutions for Seismology (IRIS) Data Services map showing the location of seismic stations from all available networks (permanent or temporary) within a radius of 0.18° (about 20 km at mid-latitudes) from the given location of Iyang-Argapura. Users can customize a variety of filters and options in the left panel. Note that if there are no stations are known the map will default to show the entire world with a "No data matched request" error notice. Large Eruptions of Iyang-Argapura Information about large Quaternary eruptions (VEI >= 4) is cataloged in the Large Magnitude Explosive Volcanic Eruptions (LaMEVE) database of the Volcano Global Risk Identification and Analysis Project (VOGRIPA).